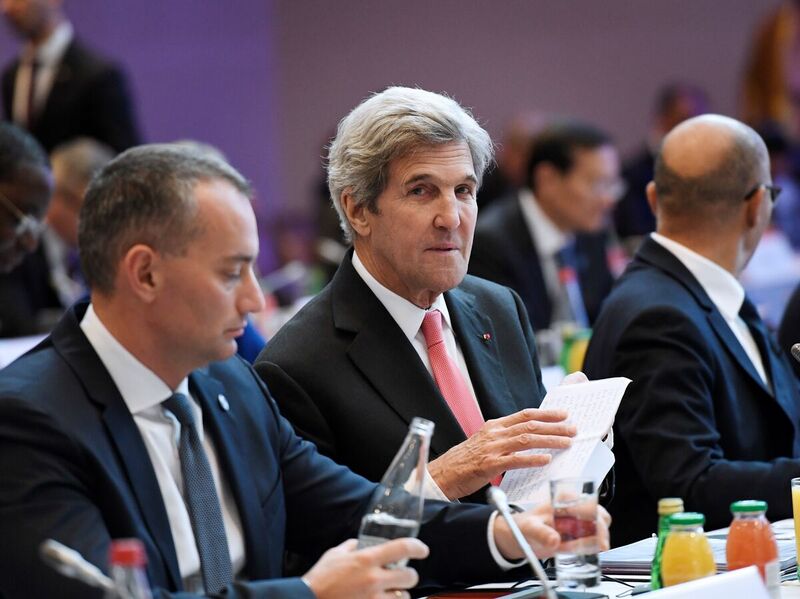 John Kerry And Diplomats From 70 Countries Gather In Paris To Discuss Israel-Palestinian Peace : The Two-Way The conference, attended by 70 diplomats including Secretary of State John Kerry, nevertheless did not include leaders from the two sides the diplomats mean to reconcile: Israel and Palestinians. U.S. Secretary of State John Kerry attends the peace conference in Paris on Sunday. Foreign ministers and representatives from about 70 countries are seeking to revive the moribund Israeli-Palestinian peace process. A joint statement issued after the one-day conference also warned against any parties taking unilateral action on the conflict. Israeli Prime Minister Benjamin Netanyahu refused to attend, decrying the conference as biased against Israel from the outset. "It's a rigged conference, rigged by the Palestinians with French auspices to adopt additional anti-Israel stances," he said Thursday, according to the Israeli newspaper Haaretz. Palestinian Authority President Mahmoud Abbas also did not attend, though he praised France for organizing the summit. Despite the absence of the two parties, French President Francois Hollande asserted the importance of holding the meeting anyway. As NPR's Eleanor Beardsley reports, Hollande said the two-state solution is in danger — and that without a solution, the conflict between Israel and Palestinians threatens to have detrimental effects on the rest of the region. "Hollande said with the international community mobilized against ISIS, some may think peace in the middle east can wait. But we will never stabilize the region if this oldest conflict is not solved. "Hollande said the continuing Israeli-Palestinian conflict serves as a pretext for criminals and terrorists across the Arab world. U.S. Secretary of State John Kerry participated in Sunday's talks in order to "try to ensure America's continued interest in a two-state solution is preserved," Eleanor says. The State Department has said he is attending to make sure that "whatever happens in this conference is constructive and balanced," the BBC reports. It also may be meant as a message to Kerry's successors, the diplomatic team of President-elect Donald Trump, who is set to be inaugurated Friday. Trump has given indications that he is supportive of settlements Israelis have established in land the country captured in 1967, which have been central point of contention in peace negotiations. Last month, Kerry delivered a speech condemning Jewish settlements in the West Bank and affirming his own support for a two-state solution. The United States also declined to veto a U.N. Security Council resolution critical of Jewish settlement activity. Trump's incoming administration is expected to adopt a decidedly different tack, however. The man he has picked to be the next ambassador to Israel, David Friedman, has said he hopes to serve his position from a new U.S. embassy in Jerusalem — a city in which both sides have lain claims. That move would be seen as a de facto recognition of the city as Israeli's capital. Abbas has warned against such a move, saying Saturday that relocating the embassy from Tel Aviv to Jerusalem would cause peace prospects to suffer. Yet statements like these from Trump and his proposed team have encouraged Netanyahu, who referred to them in his comments condemning Sunday's conference. "It's a relic of the past," Netanyahu said. "It's a last gasp of the past before the future sets in." The U.K. emerged skeptical of the summit's results, with the British Foreign Office saying it had "particular reservations" about peace talks held without either Israeli or Palestinian leaders. In a statement, it also questioned the effectiveness of a summit "taking place just days before the transition to a new American President when the U.S. will be the ultimate guarantor of any agreement." The U.K. did not join in backing the final communique from the conference. Despite these public misgivings, Ayrault said the goal of the French hosts is to make a first step toward reopening peace talks, even if it's a small one. "The parties are very, very far apart," Ayrault said, "and the goal is to bring Israelis and Palestinians back to the negotiating table."